HCM City has called for investment in environmental protection projects from now through 2025 and announced incentives for such investment as it seeks to resolve certain problems soon. A waste-burning facility at the Go Cat landfill in HCM City’s Binh Chanh District. VNS File Photo. A spokesman for the Department of Natural Resources and Environment said some 8,900 tonnes of solid wastes are collected daily in the city and treated at the Phuoc Hiep waste treatment complex in Cu Chi District and Da Phuoc Waste Treatment Complex in Binh Chanh District, with 69 per cent being buried and the rest burnt and recycled. The volume is set to increase by 5 per cent a year to 10,081 tonnes per day in 2020 and to 12,864 tonnes per day by 2025. 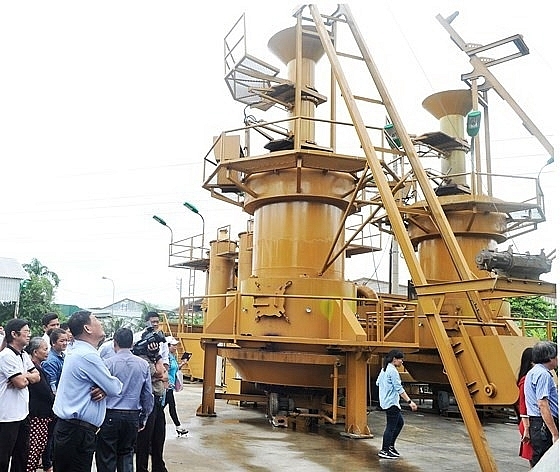 City authorities have called on investors to set up two more solid waste treatment units using recycling technology capable of handling 2,000 tonnes a day at the Phuoc Hiep Solid Waste Treatment complex in Củ Chi District. They will respectively treat harmful industrial and medical wastes using plasma waste-burning technology. The city has also called for covering unused former landfills in the districts of Cu Chi, Hoc Mon and Tan Binh to turn them into golf courses or parks or build shopping facilities or apartments on them. According to the Department of Natural Resources and Environment, investors in new waste treatment facilities will enjoy incentives related to land use rights, electricity rates, bank loans, and taxes. If the additional units at the Cu Chi and Binh Chanh waste treatment plants meet the standards set by the Government under a decision in 2013, they will enjoy tax waivers for 11 year and 70 per cent discounts on land rentals. Electricity generated by burning waste will be bought for VND2,114 per kWh, while power produced by burning gases collected from landfills will fetch VND1,532. The city will provide financial support in the form of fully subsidising interest on all bank loans obtained for projects to collect, treat and recycle waste by the private sector. All import taxes on equipment and other products not manufactured in the country will be waived. Speaking about incentives to attract investment in solid waste treatment projects offered by the city, Dr Le Huy Ba of the HCM City University of Food Industry said they are attractive.